1/35 US M4A3E2 Jumbo Model Discounts Apply ! 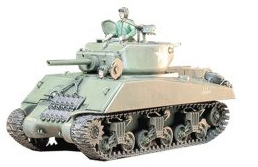 TAM35139 - 1/35 US M4A3E2 Jumbo Model. Specs and Features: The heavy 75mm M3 main gun is realistically reproduced, Turret hatches can be depicted in either open or closed position, Comes with belt-type tracks, 1 driver torso figure and 1 commander figure are included.